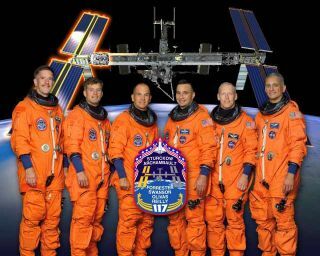 The six astronauts of NASA's STS-117 mission are (from the left) James Reilly II, Steven Swanson,mission specialists; Frederick (Rick) Sturckow, commander; Lee J Archambault, pilot; Patrick Forrester and John (Danny) Olivas, mission specialists. WASHINGTON -- NASA's next shuttle astronauts to fly, ablend of veteran spaceflyers and rookies, are in the final month of training fora March construction flight to the International SpaceStation (ISS). Veteranshuttle flyer Rick Sturckow and his fellow STS-117 crew [image]of the shuttle Atlantis lauded their spacecraft's launchpad arrival on Thursday as they prepare to haul two massive trusses and apair of new solar wings [image]to the ISS on March 15. "I thinkthe realization is really kind of starting to sink in, and you kind of come togrips with the fact that this is very soon becoming a reality," STS-117 missionspecialist Danny Olivas told reporters during a preflight briefing. "To seethe bird actually make its way to the pad is an actual awesome sight." Sturckow,Olivas and their four STS-117crewmates are due to launch aboard Atlantis at 6:43 a.m. EDT (1043 GMT) onMarch 15 to deliver the new Starboard 3/Starboard 4 truss segments and theirsolar arrays to the ISS. The missionmarks the first spaceflight for Olivas, STS-117 pilot LeeArchambault and mission specialist StevenSwanson. Two-time shuttle flyer Sturckow and STS-117 mission specialists PatrickForrester and JamesReilly round out Atlantis' veteran astronaut crew. "We've beenreally focused on [training] for about nine months now, pretty much everyday," Sturckowsaid. Duringtheir planned 11-daymission, the STS-117 astronauts will stage three spacewalks to install thenew starboard trusses, unfurl its two solar arrays, and help retract an oldersolar wing reaching to starboard from the space station's mast-likePort 6 truss. Spacewalkershelped tuckaway a stubborn port-reaching Port 6 solar wing during December's STS-116shuttle flight to the ISS, a mission the current Atlantis astronautswatched closely. "We'regoing with the things that did work really well for them," said Reilly, whoserves as the lead STS-117 spacewalker, of the STS-116crew. NASAengineers have devised new tools to help Reilly and his fellow spacewalkers --Olivas, Forrester and Swanson -- to ease difficulties like stuck bolts andstubborn launch restraints such as those encountered during NASA's STS-115mission in September2006, which delivered a portsideset of solar arrays in a near mirror image of the upcoming Marchspaceflight. "Kind ofthe theme running through here is that we get to learn from the challenges thatother crews have faced," Forrester said. Two extraflight days and a spare spacewalk could be added to the STS-117 mission shouldthe astronauts run into any unforeseen challenges, mission managers saidThursday. As an addedbonus, Forrester and Sturckow -- who flew together during NASA's STS-105mission to the ISS in 2001 -- are once again teaming up for an orbitalspaceflight. "For mepersonally, it was just a pleasure to be reassigned to fly with him again,"Forrester said. "What it allowed me to do is know where he was coming fromreally from day one in our training." During the STS-105mission, Forrester and Sturckow also flew to the ISS with Russiancosmonaut Mikhail Tyurin, who was then a member of the orbital laboratory'sExpedition3 crew. Now, almost six years later, Tyurin is again in Earth orbit servingas a flight engineer with the space station's Expedition14 crew, which will host the STS-117 astronauts next month. "We'relooking forward to seeing him again when we get on orbit," Sturckow said ofTyurin.